With a tangy, rich flavor and velvety consistency, cheesecake’s characteristic qualities make it well-suited to variation: Lemon cheesecake, chocolate cheesecake, and berry cheesecake are all common. But our favorite variation might just be pumpkin cheesecake. 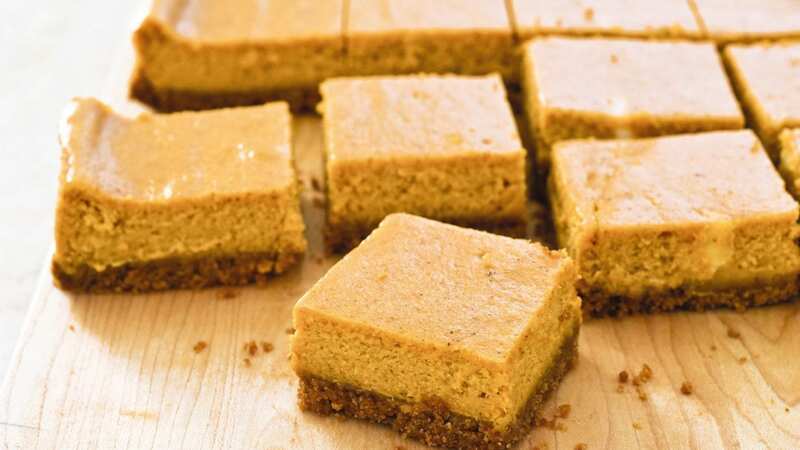 We love the way the tangy cream cheese offsets the warm-spiced pumpkin, and we set out to create a streamlined version in the form of a pumpkin cheesecake bar. To avoid a soggy, heavy bar, we knew the key would be to remove excess moisture from the canned pumpkin, so we cooked the puree on the stovetop to reduce it. This step also concentrated its flavor and enhanced its sweetness so it wasn’t overshadowed by the cream cheese. Adding pumpkin pie spice to the puree as it cooked allowed its flavor to bloom. We thought a gingersnap crust would be a fitting match for the pumpkin filling; but while the flavor of the crust was great, we found that the crushed gingersnaps baked up unappealingly hard.To get the flavor of gingersnaps without the tooth-breaking snap we used the traditional graham crackers and simply added ground ginger to the crackers to spice them up. Bake until edges are slightly puffed and center is just set, 45 to 50 minutes. Let cheesecake cool completely in pan on wire rack, about 2 hours. Refrigerate until thoroughly chilled, at least 3 hours or up to 24 hours. Using foil overhang, lift cheesecake from pan. Cut into 24 pieces before serving.